For all the romanticized hyperbole when The Ice Bowl is brought up, The Freezer Bowl is largely forgotten about. The 1981 AFC Championship between the Cincinnati Bengals and the San Diego Chargers was colder from a wind chill factor perspective at -59*. Do you realize that is 90* below freezing?? This was where Air Coryell unceremoniously crash landed for good and became the ultimate lesson on why achieving home field advantage is so important. Head Coach Forrest Gregg carried off by his Cincinnati Bengals players. One man happened to be involved in both games. Hall of Fame Tackle Forrest Gregg started for the Green Bay Packers in the ’67 NFL Championship. Then he went into coaching where he was the Bengals head man when they advanced to the ’81 AFC Championship Game. The winner would make the trek to Super Bowl XVI in frozen Pontiac Michigan, they first had to endure the coldest game in NFL history. Coming into 1981 the San Diego Chargers had been the vanguard of the new passing offenses that dominated with the rules of 1978, which liberalized the passing game. Head coach Don Coryell had revived the passing attack with many of Sid Gillman’s principles from the old AFL Chargers and forged a passing game that became the scourge of the league. Now the head slap was outlawed on the line of scrimmage. Offensive linemen were allowed to extend their arms in pass protection, and receivers weren’t allowed to be hit after 5 yards. 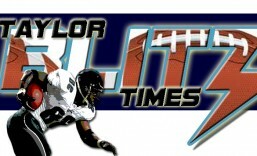 Offenses had been liberated from the thunderclap of defense which had dominated both the AFL & NFL since the mid 60’s. Dan Fouts became the 1st QB to challenge and break Joe Namath’s all time record 4,007 yards passing when he broke it with 4,082 in 1979. Then he pushed it to new heights throwing for 4,715 yds in 1980, and finally 4,802 in 1981. However his Charger teams fell short of greatness by short circuiting in the playoffs. First they stumbled in a mind numbing 17-14 upset loss at home to the Houston Oilers in ’79, then again to the arch rival Oakland Raiders in the 1980 AFC Championship Game. Also a loss at home in sunny San Diego. In all reality this team was losing it’s prime and not capitalizing on the championship window that was before them. Armed with 3, 1,000 yard receivers in TE Kellen Winslow, WR Charlie Joiner, and now WR Wes Chandler, it was interesting to watch individual battles. Fouts led the league with 33 TDs, the late Chuck Muncie led the league with 19 rushing TDs to go with his 1,144 yards and James Brooks had nearly 900 yds from scrimmage and 6 more scores. Nevertheless they fell to 10-6 and had to go on the road in the ’81 playoffs. One reason this game wasn’t remembered with the reverence of The Ice Bowl is it didn’t produce a champion. Another reason is it was buffered against 2 other memorable playoff games in January 1982. One was the Epic In Miami where the Dolphins and the Chargers played in 76* weather for 6 quarters in a 41-38 divisional thriller. The other was The Catch in the NFC Championship between San Francisco and Dallas the following week. Yet earlier on January 10, 1982 San Diego’s 2nd straight road affair took them to Cincinnati for the AFC Championship Game. If you’re keeping score at home, yes the San Diego Chargers had to play in 140 degree temperature difference in one week’s time. There were heated buses outside Riverfront Stadium in case fans needed to get warm. A Sports Illustrated article the following week reported 43 fans suffered heart attacks at the game. Temperature difference withstanding, the divisional game against Miami went into 6 quarters in high humidity, so the Chargers were exhausted. Age and injuries caught up to the Chargers as well as AFC West opponents to their air attack. John Elway and Marcus Allen came in and the balance of power shifted toward the Broncos and Raiders. In 3 of the next 5 years, Fouts watched those teams play on the Super Bowl stage he so desperately wanted to lead the Chargers to. He retired after the 1987 season and when you look back to the 2 AFC Championship Games lost it was this one that produces the most what ifs. When you mention receiving records in the NFL, the name that sits a top several categories is Jerry Rice. However there have been great performances and incredible stats gathered by other receivers. What gets lost are the records that were broken by others just before Rice came into the league. One such record was set by Mark Clayton of the Miami Dolphins. Clayton on his final touchdown romp. 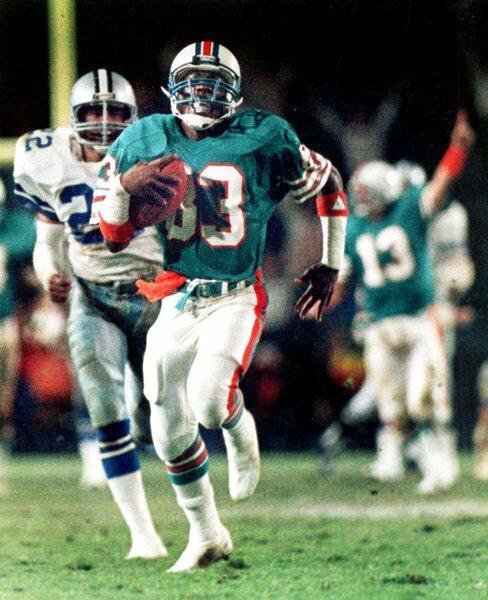 You need to understand the Dolphins had played in Super Bowl XVII at the end of the 1982 season. The late David Woodley struggled in the second half of that loss completing just one pass. 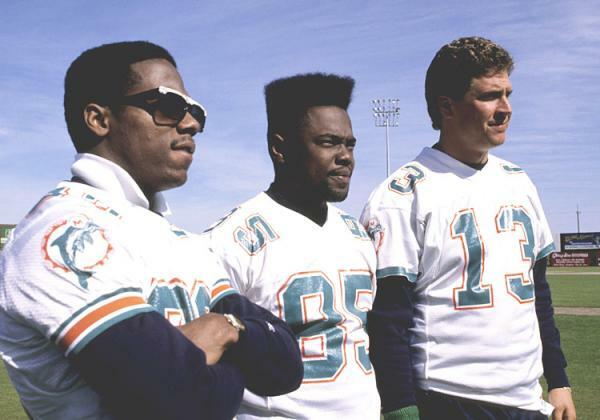 The following draft Don Shula moved to upgrade not only his quarterback, Dan Marino in the 1st round, but began to look to upgrade one of the league’s slowest receiving corps in the draft. Clayton was selected in the 8th round from Louisville in the same ’83 draft. Thus began the genesis to one of the NFL’s greatest offenses. Clayton began slowly as a reserve catching just 6 passes in his rookie year. He teamed with fellow reserve WR Mark Duper to form the core of what would be Shula’s new passing game. All three played with a chip on their shoulder all year long as they assaulted defenses on a week to week basis. While Marino shattered the all time record for touchdowns thrown in a season, he was within 58 yards of Dan Fouts yardage record going into the finale vs. Dallas. Overshadowed by the records Marino was eclipsing, Clayton entered the finale just 2 touchdowns shy of an even longer standing record. Elroy “Crazy Legs” Hirsch’s record of 17 TD receptions which had stood since 1951. He would have to do it against a Dallas Cowboy team that needed a win to make the playoffs. Clayton had scorched the NFL’s 7th rated pass defense for 4 recpts 150 yards and 3 touchdowns. His two 4th quarter touchdowns allowed him to set the new record at 18 TD receptions. . His record stood until Rice broke it in 1987. Then Randy Moss pushed the record to 23 in 2007. In fact only Sterling Sharpe in 1994, Rice, and Moss are the only receivers to amass 18 touchdowns in a single season. Just 4 receiving seasons in 65 years. Clayton’s 1984 season of 78 rec. 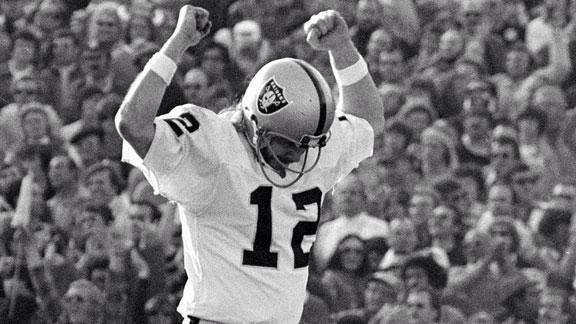 1389 yds 18 TDs was among the greatest in history. He had a good career with 5 Pro Bowl seasons, 5 – 1,000 yard seasons while finishing with 582 catches 8,974 yards and 84 touchdowns. He did leave his imprint on the game and his signature moment was his record breaking Monday Night in 1984.